I thought you might like to have a photo from the spelling bee that the Rotary Club conducted. 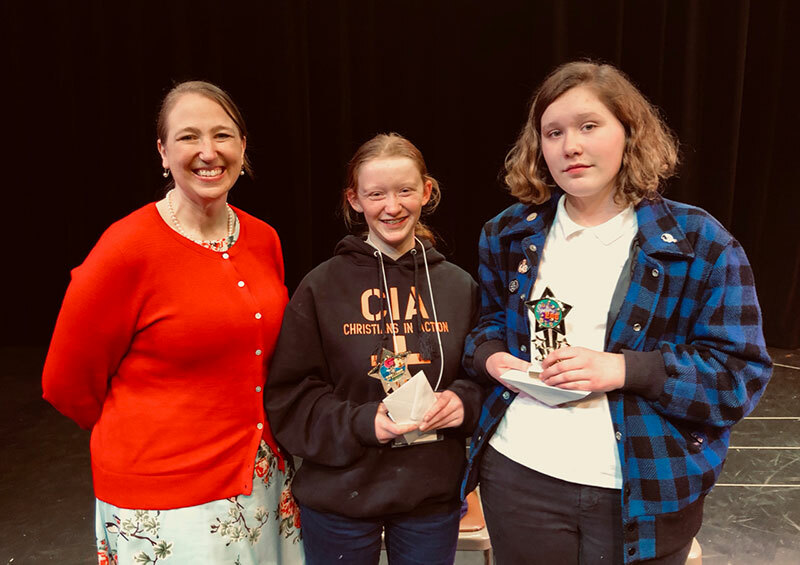 Here is winner Eve Hulse and runner-up Haley Rennick (in the middle) and their teacher Mrs Hallock of the Paideia Classical School. They are both in the 8th grade. So this class scored big time as there were cash awards to the kid’s class for first and second place. 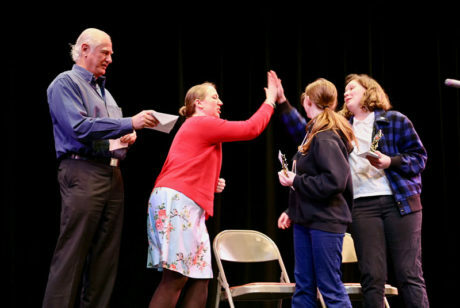 “Quantum” was the correct spelling for Eve Hulse, 8th grader from Paideia Classical School, the first-place winner at the 14th Annual Rotary Spelling Bee on March 7 held at the San Juan Community Theater. Eve received a trophy and a check for $100. Her 8th grade class, taught by Mrs. Hallock, was awarded $200, and her school received $300. In second place was Haley Rennick, 8th grader and Eve’s classmate at Paideia Classical School. Haley received a trophy and a check for $75. Her class, also taught by Mrs. Hallock, received $150, and her school was awarded $200. The other 18 participants received a medal in appreciation for their participation. The ‘calmer of nerves’ was Bob Jarman, Pronouncer was Carol Linde, and judges were Mary Sliger and Carla Wright. Medals were given by Cyndy Gislason. Interact Club members assisted. Community Service: Rock the Dock (1993-2013) Concours d’Elegance, 36 Weekends, Spelling Bee, Knowledge Bowl, Student Bus Shelter, bike turnout. IPA: combine resources of Rotary Clubs in the Northwest WA to build relationships and sponsor projects in Copan, Honduras, PolioPlus Fund, ShelterBox. Literacy: Distribution of dictionaries to 3rd, 4th, 5th graders, Free Children’s Library at Fair Grounds (Roche Harbor pending). Youth Services: Interact Club at FHHS, YAIL & RYLA events, Youth Exchange (every 2 yrs). We meet Wednesdays at the Friday Harbor House meeting room, 8 – 9 AM. Guest speakers. Open to all. Find us here on Facebook.